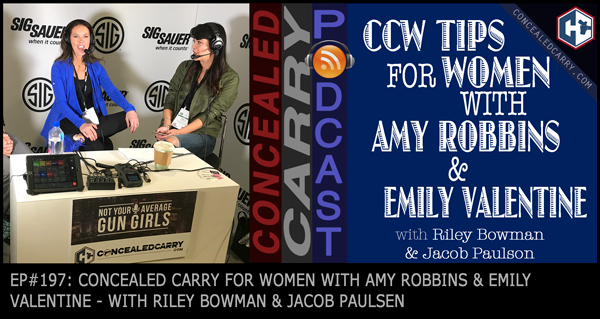 Today's episode sure was a lot of fun as Riley and Jacob interview the ladies of the new Not Your Average Gun Girls Podcast, Amy Robbins of Alexo Athletica and Emily Valentine of Style Me Tactical to talk about the new show, what their vision is, and what role they see themselves playing in further educating the masses–and especially women–about concealed carry and self-defense. Click PLAY above to listen to this fascinating and entertaining interview! Anything’s better than leaving it at home – but we can always get better. No problem: OWB Glock 17, 3 o’clock, with round in the chamber, three spare mags, tactical flashlight on support-side. Go to town, have fun! Right? No one can ever achieve that (well maybe Riley can ’cause he’s that dude), but for the most part, all of us have to do something LESS than that – less ideal, but we all have to start somewhere. They’ve trained their brain to think that’s the way you have to go, small and light. Yes, small and light is easier – but does that mean that’s what you SHOULD carry? I’m feeling humbled that I was quoted! Thanks AJ. That’s awesome, AJ! Thanks for STILL listening to us after all this time, and I’m glad you still appreciate the content. Do you mind if I ask which Facebook group you shared that on?